For some reason, I have an obsession with chairs...and clocks...and wooden crates.....and old books....and tables. I don't know why, but I've learned to live with it. How? By buying chairs....and clocks.....and wooden crates....and old books....and tables! I'm also a sucker for unusual things in usual spaces. Like this chair. Anyway, I've been keeping my eye on this chair for about 3 months, waiting for it to go on sale. The price finally dropped and I grabbed it up. The man carrying it to my car asked if I had plans to reupholster this chair. What?! And ruin a perfectly good chair?? Nope, no plans to make it functional. I like the shape and style. It fits in an awkward hallway space. I left the feed bag on it for the photo because I had the bag fixed just like I wanted it. And you know how it is when you move something...you can never get it fixed back exactly like you had it. These are the other things I've placed in the chair, just for a little whimsy. Now I do realize that the average person wouldn't have this little vignette anywhere in their house, but for me, it fits. Atypical and unusual. What strange and nonfunctional piece do you have in your house? 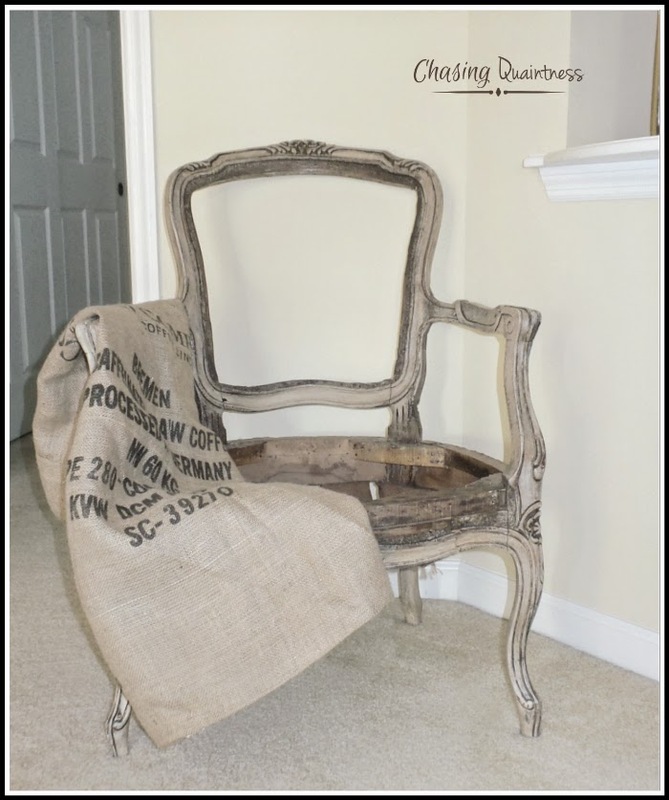 Thank you for your comment on my reupholstering a french chair post. Your chair looks awesome! Definitely unique in how you are using it. Love your page so glad to find you here! Deb, thank you for the compliment and comment! I just thought it would be something different rather than ending up in tears for days because I couldn't reupholster it. I truly love the way your chair turned out! Gorgeous!! I just started in January so I really appreciate the encouragement! I think it looks great exactly how it is - what a fun vignette ! Deconstructed chairs are all the rage at Restoration Hardware now. Yours is just a little more deconstructed than theirs. But why not use a chair as a piece of art? It's beautiful. Thank you Lisa! I fell in love with this chair the first time I saw it. It has great bones and it doesn't matter to me that it has no usable function other than it is pretty to look at! Thank you again and have a great day! Well that is interesting and I would never have thought of doing that. I was waiting for you to restore it as the bones are so stylish. Thank you! If I knew how to restore furniture, I might think about it, but the bones of this chair are lovely and I would hate to ruin it by making it normal! :-) Have a great day! Thank you so much! I will definitely be stopping over! Have a great day! Benita, this is just the mix of elegance & whimsy I adore ~ fabulous! Thank you so much, Cecilia! It is one of my special pieces for sure! Have a great evening! Oh my gosh, I couldn't stop laughing, as I'm that wife with a husband who needs how many power drills!!! ;)lol I agree, your chair is absolutely beautiful just as it is, no need to be functional! Christine, we have some of that going on over here....LOL. Thank you so much! It will stay just the way it is....I would totally ruin it if I tried to do anything else with it! Have a great evening! Hugs!! I know what you mean. I have a serious love affair with these things. Now, I've added vintage scales...LOL And let's not forget vintage suitcases...I try to keep that addiction on the DL...LOL. Thank you so much and thank you for a great link party! Have a good night!! 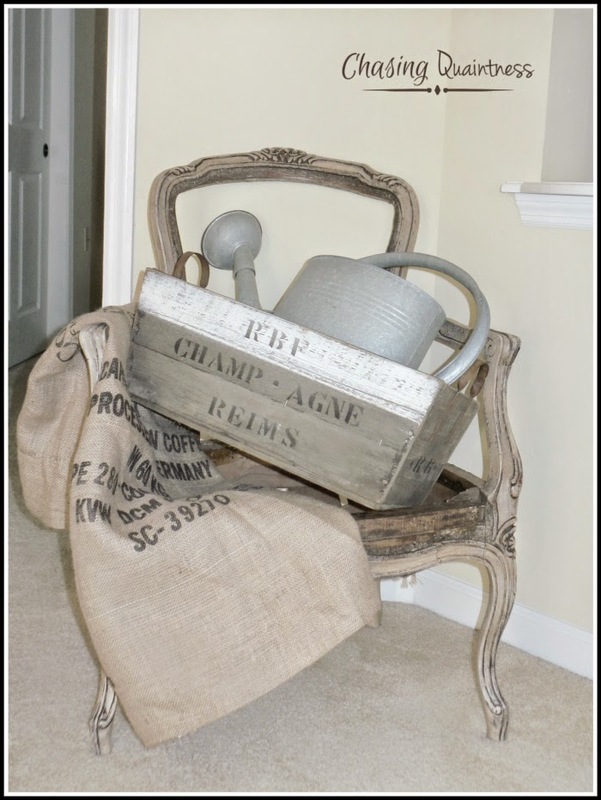 I would love to see the seat upholstered with that burlap bag!...love the color palette! Thanks for joining us on Oh My Heartsie Girl Wordless Wednesday! If I ever get brave enough....LOL. Thank you so much and thank you for a great link party! Have a great night! Love it as is Benita! Thank you so much Cindy and thank you for hosting! Have a great weekend!! This is so much fun! I just did a tour of a house that was a barn and the lady and her husband refinished the whole house eclectic farm house style with finds just as this! I am actually going to go back and take photos of her home for a post...she would love this project so I will show it to her! Thank you so much! I can't wait to see that post! I know it is absolutely gorgeous! I love unique things like that...makes the home a lot more interesting! Have a wonderful day and thank you again! I love this chair. It is perfect just the way it is!